Shown L-R: Joseph Wagoner, Product Specialist, AKG USA; Maureen Droney, P&E Wing Sr. Executive Director; Susan Stewart, South Regional Director, The Recording Academy® Nashville Chapter; Chuck Ainlay, GRAMMY Award®-winning engineer/mixer; and Peter Chaikin, Senior Manager, Recording and Broadcast Marketing, JBL. Photo courtesy of The Recording Academy®/Wireimage.com/Beth Gwinn © 2011. Photographed by: Beth Gwinn. THE RECORDING ACADEMY® PRODUCERS & ENGINEERS WING® AND THE NASHVILLE CHAPTER HOST "THE HANG WITH HARMAN"
SANTA MONICA, Calif. (December 5, 2011) — The Recording Academy® Producers & Engineers Wing®, together with The Academy's Nashville Chapter, partnered with HARMAN Professional Division's audio brands AKG®, JBL® and Lexicon® to present an exclusive event titled "The Hang with HARMAN," on Tuesday, November 15, 2011, at Nashville's famed Sound Stage Studios. An eclectic gathering from Nashville's professional audio community, ranging from top engineers and producers to studio personnel and music recording students, gathered for a cocktail reception featuring live recording demonstrations highlighting the latest microphone, signal processing and monitoring technologies from HARMAN Professional Division. With three-time GRAMMY Award®-winning engineer /producer Chuck Ainlay (Mark Knopfler, Miranda Lambert, George Strait) behind the 9000 J Solid State Logic console in the George Augspurger-designed and recently renovated Front Stage, a musical group performed, consisting of Jim Long on acoustic guitar along with wife Cherrill and daughter Betsey on vocals, and attendees were able to experience various models of JBL studio monitors, AKG headphones and AKG microphones in action. Concurrently, in the control room of Back Stage, new Lexicon PCM Native Reverb software plug-ins were demonstrated throughout the evening. "The Hang with HARMAN was a very successful event," stated Maureen Droney, Sr. Executive Director of the P&E Wing. "Our members appreciate being able to audition, and get hands-on with, the latest audio equipment in a great acoustical environment like Sound Stage. Our partnership with HARMAN is consistently win/win. They share our goal to raise awareness of the value and importance of high quality audio and those who create it." Peter Chaikin, Senior Manager, Recording and Broadcast Marketing for JBL, commented, "We have been working with the P&E Wing for several years, and we always find these kinds of events extremely valuable. The Hang with HARMAN was a wonderful opportunity to showcase our products and exchange information with the uniquely qualified and talented Nashville P&E Wing members. Established in 1957, The Recording Academy is an organization of musicians, producers, engineers and recording professionals that is dedicated to improving the cultural condition and quality of life for music and its makers. Internationally known for the GRAMMY Awards — the preeminent peer-recognized award for musical excellence and the most credible brand in music — The Recording Academy is responsible for groundbreaking professional development, cultural enrichment, advocacy, education and human services programs. The Academy continues to focus on its mission of recognizing musical excellence, advocating for the well-being of music makers and ensuring music remains an indelible part of our culture. For more information about The Academy, please visit www.grammy.com. For breaking news and exclusive content, join the organization's social networks as a Facebook fan at www.facebook.com/thegrammys, a Twitter follower at www.twitter.com/thegrammys, and aYouTube channel subscriber at www.youtube.com/thegrammys. 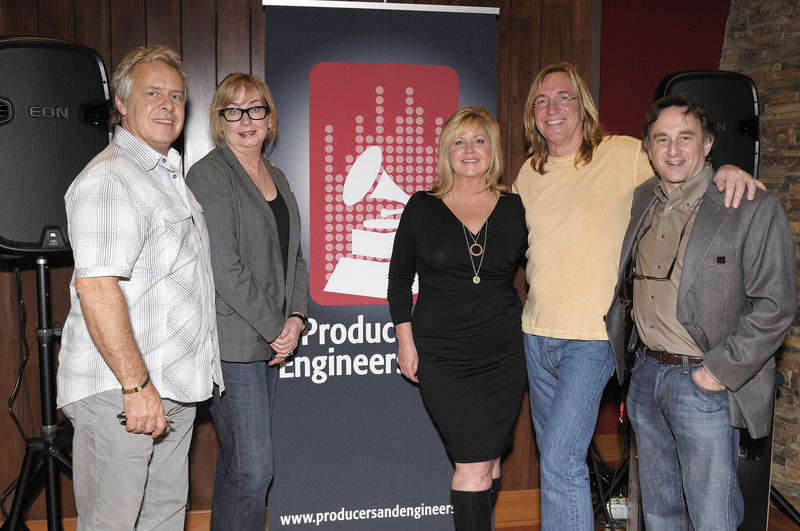 Photo Caption: Shown L-R: Joseph Wagoner, Product Specialist, AKG USA; Maureen Droney, P&E Wing Sr. Executive Director; Susan Stewart, South Regional Director, The Recording Academy® Nashville Chapter; Chuck Ainlay, GRAMMY Award®-winning engineer/mixer; and Peter Chaikin, Senior Manager, Recording and Broadcast Marketing, JBL. Photo courtesy of The Recording Academy®/Wireimage.com/Beth Gwinn © 2011. Photographed by: Beth Gwinn.